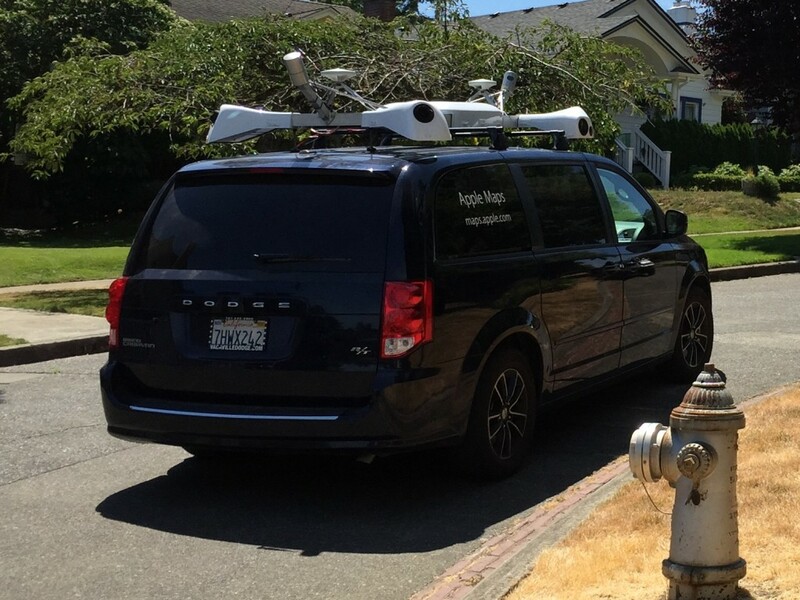 It shouldn’t be surprising to learn that Apple Maps vans are making their way to more and more locations but somehow I was surprised to be sitting at my dining room table and see one drive down our street. I didn’t realize that they were marked now, otherwise it probably wouldn’t have occurred to me until later that that’s what it was. Fortunately, we live on a dead end so it had to turn around and I was able to snap a picture of it as I ran to the curb like an idiot (or as an idiot, depending on your point of view). People often don’t believe me so I feel the need to provide photographic evidence for practically everything. It is not newsworthy that Apple Maps vans are combing the streets or that they’ve gotten down to Tacoma level in terms of size and/or risk to life and limb of the driver. The most newsworthy thing here is that, yes, a grown man will wave to an Apple Maps van driver and the van driver will feel obligated to wave back. Now I kind of wish I had saluted. I wonder what he would have done then.